CLOSURE ALERT: The Shadow of the Giants Trail was heavily damaged by the Railroad Fire in the fall of 2017 and the forest service expects it to be closed indefinitely (see the closure order PDF and this article showing photos of the damage). The current closure order officially expires after May 22, 2019, but sources at the forest service say they expect it to be extended. The other trails in the grove are still accessible. Why visit Nelder Grove? 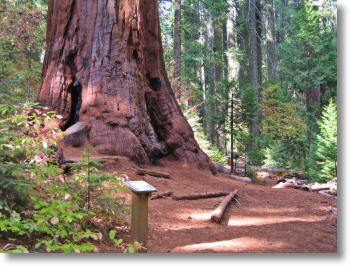 The Nelder Grove's five trails feature many highlights similar to those found in Yosemite's much more heavily visited Mariposa Grove, including a whanging great tree (the Bull Buck Sequoia) that rivals the Grizzly Giant in size; a tree you can walk through (the Chimney Tree); and a variety of second-billing mature sequoias that are not remarkable in any way other than being bigger than 99% of the trees in our solar system and older than the Magna Carta. Hiking the Shadow of the Giants trail is a singularly peaceful experience that doesn't have an equivalent in the Mariposa Grove. See the Trail Maps page for more details about what you'll find on each of the trails. Crowd Factor: Low compared to the sequoia groves in Yosemite, though there are often a few other hikers about, and the closure of the Mariposa Grove until 2018 will probably increase the flow. (Happily, the unpaved roads leading to the grove should keep tour buses at bay.) 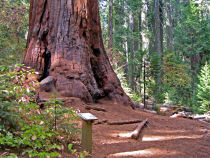 Hikers are generally well dispersed on the Graveyard of the Giants trail, but on the Bull Buck loop tend to gather at the Bull Buck tree, which is probably the grove's highlight. Hikers will be spread out on the Shadow of the Giants trail, but sound carries well there, so if there are other people around, you'll likely hear them. Difficulty: The Graveyard of the Giants trail climbs steadily and is moderately difficult; the other trails are short and easy. Best Time to Visit: It's pretty any time the road is passable (it can get snowed in in the the winter), but there's bonus scenery in the spring, when the dogwood trees are blooming, and in October, when their leaves are turning. Great Big Pine Cones: If you see enormous pine cones, 10 inches or more in length, scattered about the trail, they'll be from Sugar Pines (Pinus lambertiana). Giant Sequoia cones are only a couple inches long, about 800 times smaller than a typical mature sequoia by length/height. For the same ratio to hold in humans, the mother carrying a fertilized egg (about 2 millimeters across after three weeks) would need to be around 60 feet tall. And when you consider that a pine cone isn't actually a fertilized egg, but a spiky container for much smaller seeds, something that doesn't really have a good human equivalent - there are some practical differences between trees and people, it turns out - then our putative mother would really need to be around 300 feet tall. Driving Directions: Nelder Grove is off Road 632, also known as Sky Ranch Road. You'll find it 10 miles (16 km) south of Yosemite Park's south entrance. If you're approaching from the south, it's 4 miles (6.4 km) north of the intersection of highways 41 and 49 in Oakhurst. The road sign for 632 is small and easy to miss if you're buzzing past at 50 mph, so watch for the larger sign to the Sky Ranch Inn, which (the inn, not the sign) is just up the road. Here's a Google Street View panorama of the turnoff from the south. Once you're on Road 632, stay on it for just under 7 miles (11 km), until you reach a signed left turn to the Nelder Grove just as the pavement ends. Take the left turn and travel just over a mile (1.6 km) until the road forks. Turn left for the Shadow of the Giants trail or right for the other four trails. If you're going to the Shadow of the Giants, watch for the sign and a short but steepish and rutted driveway, half a mile along, that leads to the parking lot and trailhead. If you're headed instead for the not-The-Shadow-of-the-Giants trails, turn right at the fork and go 0.3 miles (0.5 km) to another fork. Turn left here and you'll reach the Nelder Grove interpretive center, which encompasses a pair of 19th-century cabins and scale topographic model of the area, another 0.3 miles along. The Big Ed Tree trailhead is here, followed a tenth of a mile later by the Graveyard of the Giants and Chimney Tree trailheads, and another tenth of a mile later by the Bull Buck Tree trailhead. See the driving map for more details. Parking: The Shadow of the Giants trail has a dirt lot at the trailhead that will hold half a dozen or so cars. If it fills up, an uncommon occurrence, you can park along the road. If you take the fork for the other trails instead, you'll find room for a couple cars at the interpretive center (also the Big Ed Tree trailhead). Shortly afterwards you'll pass a larger lot shared by the Graveyard of the Giants and Chimney Tree trailheads, and past that more parking for the Bull Buck trailhead. These four trailheads are only separated by a few hundred meters, so any place you find to park should suffice. Pets: National forests are generally more lenient than national parks are about pets. Pets are allowed in Sierra National Forest (where Nelder Grove hangs out) as long as they're kept on a leash of six feet or shorter in campgrounds and recreational areas and kept on a leash or under voice control in wilderness areas. You're strongly encouraged (and in wilderness areas, required) to clean up your pets' waste. See these NFS links for the official info on pets in wilderness areas and the Sierra Forest in general (PDF). Hazards: Once you turn off Road 632, the pavement ends. The first mile, to the Shadow-of-the-Giants/non-Shadow fork, usually isn't deeply rutted but is prone to washboarding. The roads past the fork can be muddy or rutted, and the short driveway leading to the Shadow of the Giants parking lot can be a challenge for cars with poor clearance. Once you reach the fork, you're within half a mile, roughly, of all the trailheads, so if you reach a stretch of road that your car	isn't confident about, it won't be too much of a burden to just park and walk the rest of the way. Besides the mud and rut issues, the road is often undrivable altogether in the winter (plowing stops a couple miles up Road 632), and there can be snow on the road well into May.